First of all I want to I wish everyone a happy Thanksgiving. This week I am posting my blog a little earlier because of the holiday. What an important and beautiful feast day this is, which has not been commercialized like so many other annual celebrations. The religious themes of gratitude to God, love and unity of families, and the call to share the blessings of those less fortunate are all central to what Thanksgiving is about for Americans. 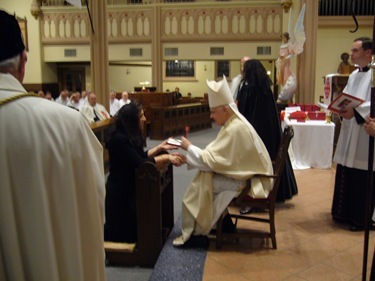 Friday evening I was happy to attend a vigil at the Springfield Cathedral with the northeastern lieutenancy of the Order of the Holy Sepulchre. At the vigil we prayed for the deceased members of the Order. Bishop Timothy McDonnell welcomed us in his cathedral which is marking its 150th anniversary. 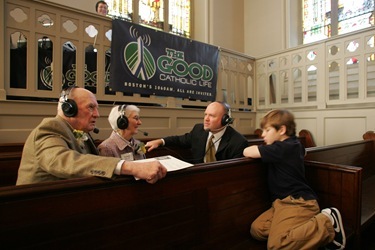 Bishop Bob McManus from Worcester was also with us for the celebration. I was happy to greet the current lieutenant, Jack Monahan as well as past lieutenants George Ryan and Dennis Looney, who are part of the Grand Magisterium of the Order. 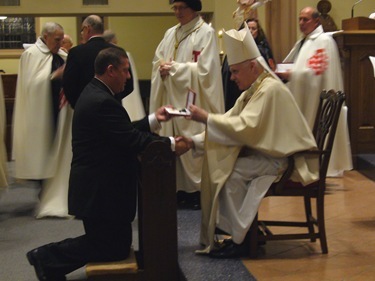 The next day Archbishop O’Brien, who has recently been appointed Grand Master, celebrated Mass and invested 24 new knights and 24 new ladies as members of the Order. 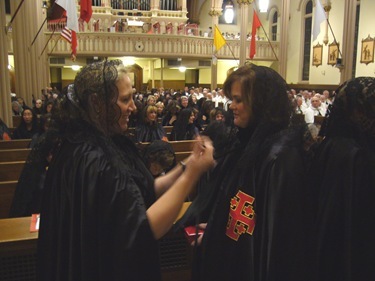 The Order has 28,000 members worldwide and is entrusted with providing support to the Latin Patriarchate of Jerusalem and Catholics in the Holy Land. Saturday we were visited by three Swiss Guards, who brought me a book commemorating the 500th anniversary of the papal guard. So we gave the three young Swiss Guards a tour of the Cathedral. 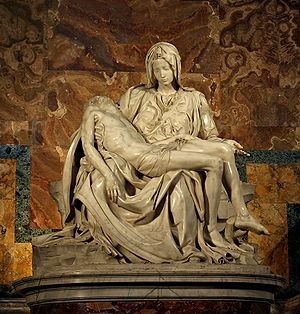 I had a picture taken with our “Pieta” downstairs. 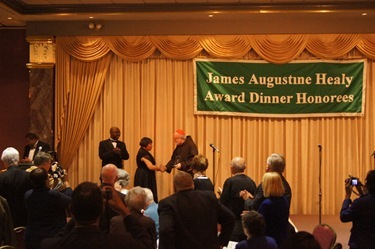 Saturday night was the 19th Annual Bishop James Augustine Healy Award Dinner. 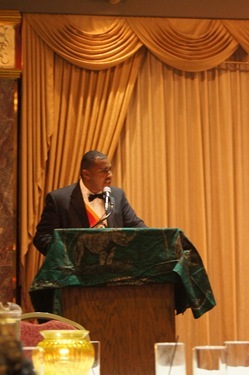 Fredron Dekarlos Blackmon, OBL, S.B., who is the Supreme Knight of Saint Peter Claver gave a beautiful talk. They give out two awards, the Healy and the Ruffin awards. Bishop James Healy, being a priest of Boston, became the first black bishop in the United States. Robert Leo Ruffin was a layman in the 1800’s who went to the first Black Catholic Congress. 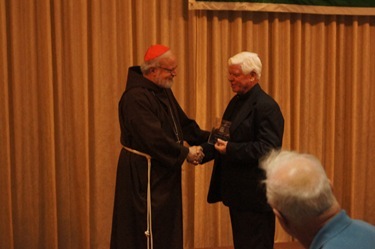 He was a great promoter of Catholic education. 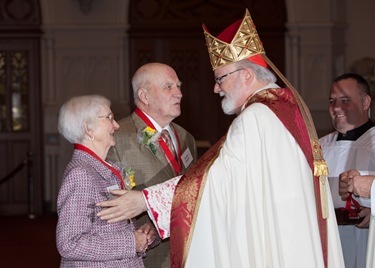 This year the awards were given to Judge Antoinette E. McLean Leoney and Father Gerald Osterman. They both gave very moving speeches. Meyer J. 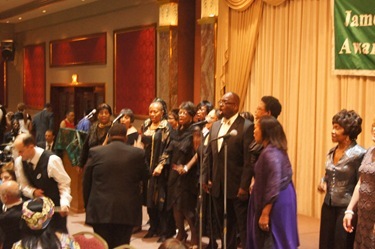 Chambers was there with the Archdiocese of Boston Black Catholic Choir, who sang. Judge Leoney’s niece Lauren C. McLean-Britt also sang a beautiful solo. 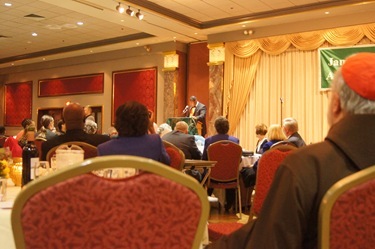 There was a very large crowd this year, and it is always a great celebration of the contribution of the Black Catholic community to the body of the Church. It’s always a very joyful and moving celebration. We were saddened this year by the news that the head of our Office for Black Catholics Lorna DesRoses’ father passed away, and she was unable to be present. 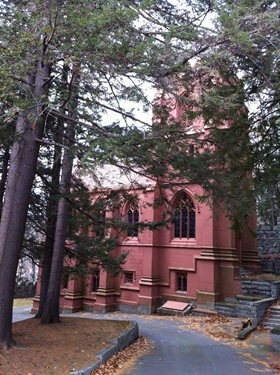 Sunday was the feast of Christ the King, and we had a Mass at the seminary chapel. 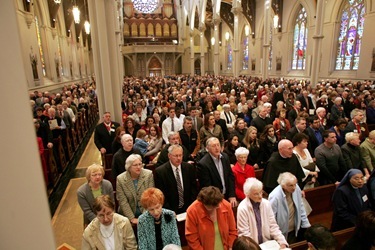 Members of Cardinal O’Connell’s family were present at the Mass. They sang songs written by Cardinal O’Connell who was a gifted composer. Afterwards we went into the courtyard and blessed the grave and tombstones. 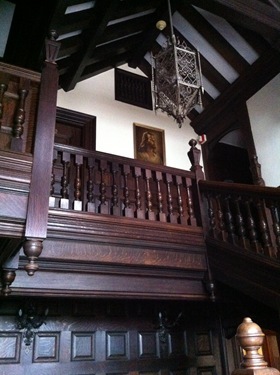 During the summer Cardinal O’Connell’s remains were moved to the current location in St. John’s courtyard. I presided over evening prayer at the cathedral for the Cheverus Awards ceremony, which we hold on Christ the King Sunday. 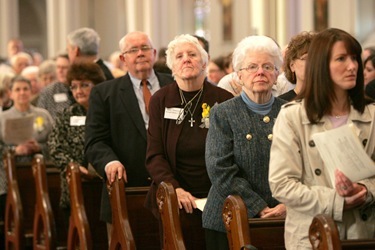 It’s fitting that it’s a few days before Thanksgiving because, of course, our sentiments at the Cheverus Awards are always of gratitude to God for our good and faithful Catholics, and very special gratitude for these people who we recognize because of their generous and faithful service that allows the parishes and the agencies in the diocese to run. 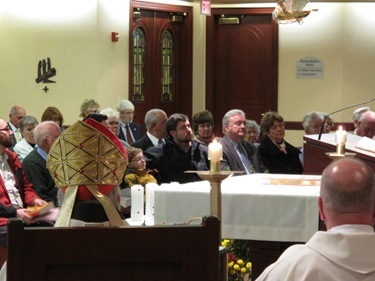 We had a full cathedral, so it was a very uplifting gathering in which we could recognize people working in their parish at CCD, pro-life, prison ministry, hospital ministry, and parish administration, just a whole variety of works of mercy, and evangelization, and service. We began these award ceremonies in our bicentennial year. I thought it was important for us to have some vehicle to thank and recognize the loving service of so many people, who give years of their lives to serve the Church. 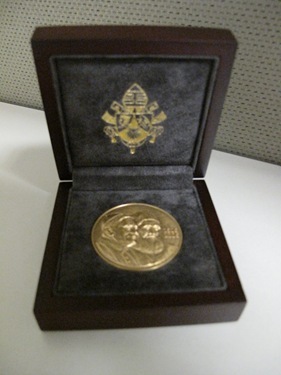 One of the persons who received the medal came up with her pastor. She was 99 years old. Just think how many years she has been at the service of her community. It’s a joy to be able to do something to recognize that. 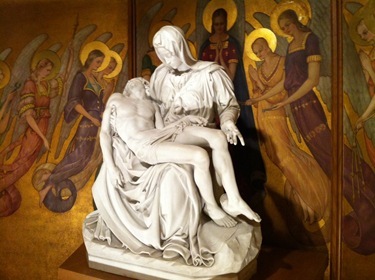 Nov. 21 was the Feast of the Presentation of Our Lady in the Temple. 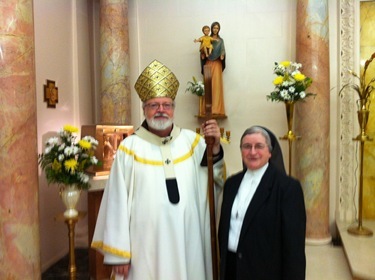 I went to the Presentation of Mary Academy to visit the sisters and the students, including a number of retired sisters there. 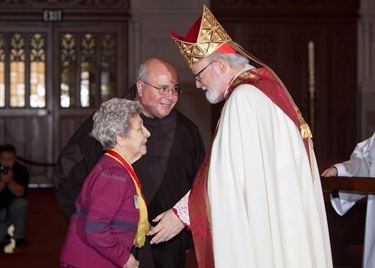 One of the sisters, Sister Mary gave the students a history of the foundation of the order by Blessed Ann-Marie Rivier, who founded the order on the Feast of the Presentation. Sister Susan has just been elected to their central government and will be going to Rome. We want to thank her and congratulate her. She gave me a tour of some of the estate. 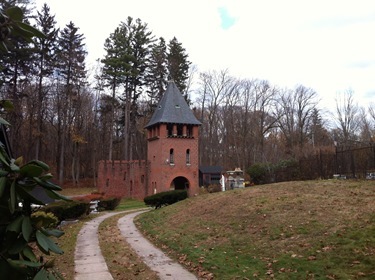 The sisters acquired that land about fifty years ago. It’s like a medieval village. 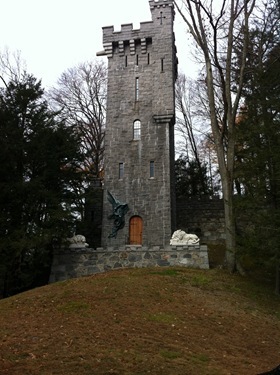 There’s a huge stone wall around it. 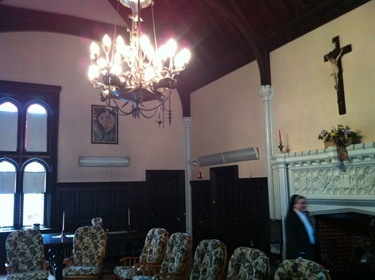 It has all these archways, and interior courtyards, and chapels. 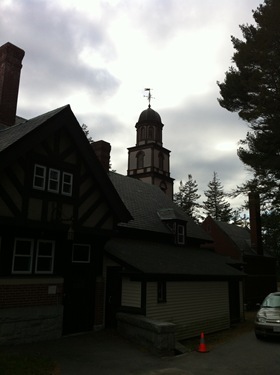 There are twenty buildings, I think, on the land, and bell towers. It’s just an extraordinary facility that the school is on. Tuesday I met with the new Commander of the Salvation Army of Massachusetts, Major David Kelly and his wife Naomi, who are new to the area. He’s just been assigned to head the Salvation Army in Massachusetts. We were very happy to discuss ways we might work together. I thanked him for his work among the poor and for his outreach coming to see us. 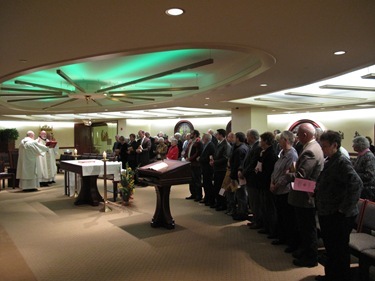 Every year during the month of November, which is the month we pray for the holy souls, we offer a Mass for the departed deacons and their loved ones, particularly those who died during the past year, but all of those who served the Archdiocese. 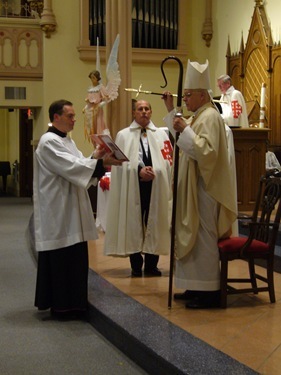 This gives us an opportunity to bring the diaconate community together.